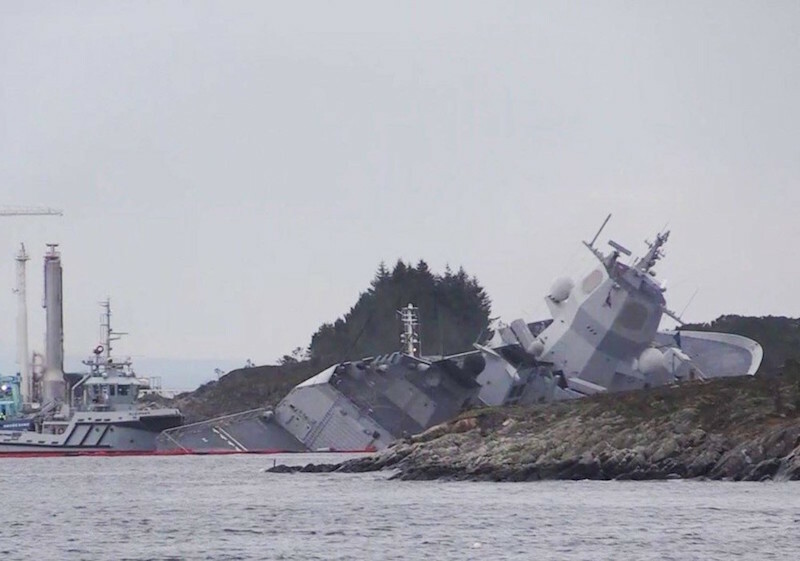 The Norwegian frigate KNM Helge Ingstad has been involved in a collision with the tanker Sola TS. All personnel are now evacuated, eight people have had slight injuries and are being taken care of. A press conference will be held at. 13.00 on Haakonsvern. Attendance at the gate at Haakonsvern base by noon. 12.45. The collision took place around 4:00 on Thursday morning in Hjeltefjord, north of Sotra. The frigate KNM Helge Ingstad collided with the oil tanker Sola TS. The frigate started to take on water and the crew was evacuated. All 137 people who were on board the vessel have been evacuated. Eight people have suffered minor injuries and are now being taken care of. The frigate was sailing as part of NATO's standing naval force (SNMG1) when the incident occurred. OSLO --- A Norwegian navy frigate and a Maltese oil tanker collided in a fjord in western Norway on Thursday, local authorities said, with seven people receiving minor injuries.